Our faith matures as we examine the true meaning of Christmas in God's gift to mankind. The following points to ponder will challenge you to move beyond a commercialistic view of Christmas to God's gift of Jesus Christ. Why was the King born from a virgin? 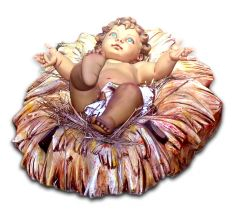 Jesus choose to be born as a babe in a lowly manger. Does our gift giving at Christmas resemble the same spirit as the wise men's gifts to baby Jesus? Having a star at the top of the Christmas tree may be a reminder of the journey the wise men took to meet King Jesus after His birth. The wise men prepared themselves for Jesus birth by knowing how to identify His star. How are you able to prepare yourself to meet with the Lord Jesus? Mary showed her obedience to the Lord while riding on a donkey to Bethlehem while pregnant. The census which brought Joseph and Mary to Bethlehem for the birth of Jesus was the fulfillment of prophecy. This provides assurance for us that God orders are steps when we endeavor to live for Him. God choose to come into the world as a child and not a prophet or a king which the people were looking for. We in turn may find God at work in our lives in unexpected ways. The word 'Christmas' contains 'Christ' --- a reminder of the true reason for celebrating. God brought Joseph, Mary and baby Jesus to safety as King Herod was destroying the baby boys born at the same time. When we live for God He guides our lives by the power of His Holy Spirit. Is your faith strong enough to hear and see the Angels of God in the spiritual world fighting and looking after you like the family of Joseph, Mary and baby Jesus? Joseph and Mary had faith like Noah in the days of old which allowed God to use them and entrust them with even more responsibility as they lived and acted on His love. God's gift for mankind is Jesus. Once a baby He is now seated at the right hand of the Father. This is the most precious gift this world has to offer. Have you opened this gift yet?